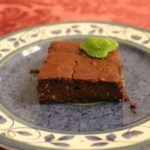 I found this recipe, which I tweaked a little in a wonderful out of print cookbook, The Low Carb Gourmet by Karen Barnaby. You can make a half recipe in a 8” square pan as well. These were really good. In a large bowl, beat the cream cheese and Butter until smooth. Beat in the chocolate and sweetener. Beat in the eggs, 1 at a time, scraping the bowl well after each addition. Add the coffee and extracts. Beat until combined. In a medium bowl, mix the almond meal, cocoa, salt, and baking powder. Add to the chocolate mixture and beat well. Scrape into the prepared pan and smooth the top. Bake for 35 to 40 minutes, until the top is firm. Cool on a wire rack before cutting. Store, covered, in the refrigerator. Per Brownie, if cut into 24 servings: Effective carbohydrates: 3 grams each. Enjoy! Thanks for this alternative brownie recipe. I’d leave out the coffee and would guess it would be fine. It sounds extra rich already with both the unsweetened chocolate and cocoa. I appreciate your message and hope the word spreads about gmo’s.